Welcome to CCC's Grand Theft Auto IV Launch Site! It contains loads of info about Grand Theft Auto IV: cool videos, articles, and more! You'll find it all right here, at CheatCC! Grand Theft Auto IV is the latest entry in the groundbreaking Grand Theft Auto series, and the first next-gen GTA! Players will be able to revisit a newly revamped and redesigned Liberty City, where the old is made new again. Xbox 360 owners will be able to enjoy future episodic content that will keep the gameplay fresh. 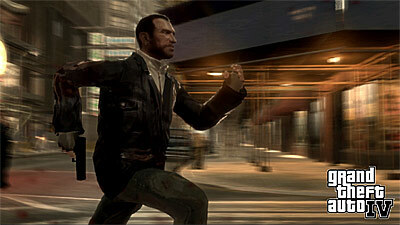 Ready to get the most out of Grand Theft Auto IV? Don't forget to check out our cheats section, where you'll find cheats, tricks, hints, and everything you need to know about secrets and unlockables included in the game. Keep checking back for more! "Good Lord, What Are You Doing?" aka "Everyone's a Rat"
Click Here to See a Slideshow with More Screenshots!